me and him: New Photo by Geri Blogsite!!!! New Photo by Geri Blogsite!!!! There have been many many many long days and late nights working over the past few weeks and now there is a glimmer of light at the end of my tunnel (thank heaven!) and some of the projects are staring to come together (I literally just heaved a heavy sigh of relief right there). These projects are good too.... I am so excited to share them with you! 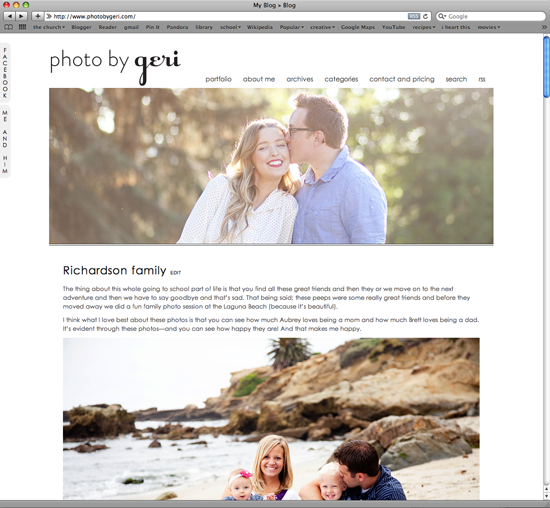 One of the biggest things I've been cooking up is a rebrand for Photo by Geri and a whole new photo blogsite! Yay!! Photo by Geri is now a true, blue .com sort of business. For some reason web hosting and all the .com madness has been so intimidating to me—but once I took the plunge I never looked back and I am pretty happy with the results. There is still work to be done—but it's finally presentable for the public and a brand new, awesome session is just waiting to be looked at by Y.O.U. Yay!!!! It looks so good, Geri! Hooray! @anthropologieconnoisseur: Not a creeper even a little bit. I was wondering if anyone would catch those ;) I am SO excited to post those beauties!!! Look for them at the front of next week.... eeeeek!!! love it! and can't wait for christmas time when you come back to these parts of the woods and take pics of my family of 4...eek 4! seriously, hope you are planning on doing mini sessions or booking a session for me during the holidays :)! really love the new site, you're fabulous darling (said that with a british accent). Oh hey!!! It's my face!! Ger- the site looks GREAT!! Seriously, you must be an HTML genius or something because you have tons of fancy little gadgets over there ... those side bar pullout thingies?? BLEW. MY. MIND. You may find yourself becoming my personal Yoda.